We have a flock of laying hens here on the farm, free to walk around in their hen house with nests, in which they lay their eggs. (They lay one egg per day.) We collect the eggs daily, wash them and have the for sale in the Creamery. Gift cards can be purchased with any amount you desire. Good for any occassion and redeemable only in the ice cream stand. Gift Card(s) can be reloaded at the time of ice cream purchase. Gift Card(s) may not be redeemed for cash only. The customer is required to make up any difference between the total cash value of the gift card(s) surrendered and the price of the ice cream products purchased. If the value of ice cream products purchased is less than the total cash value of the gift card(s) surrendered, change will be tendered. 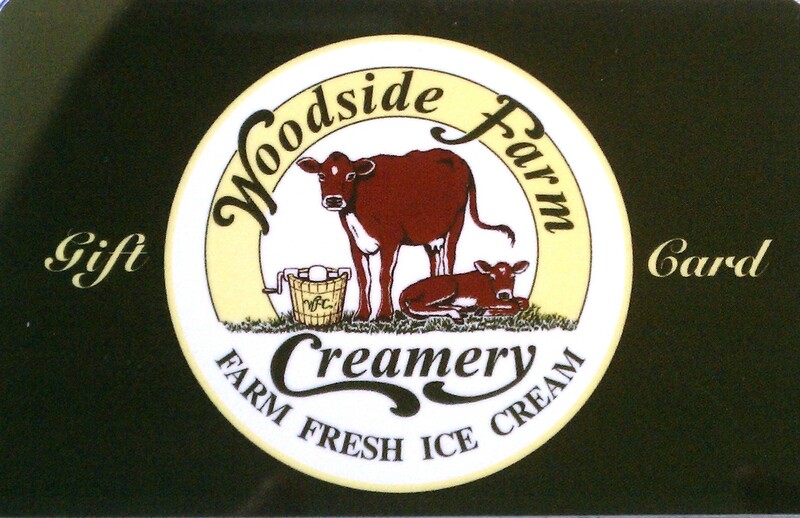 Woodside Farm Creamery has $1 and $2 tokens available for purchase through the ice cream stand. These are ideal for handing out in appreciation of a task well done or in thanking someone for their help, support, or simply being there in a time of need. Purchase as few or as many as you require. Remember that tokens are great to hand out at Halloween, easy to slip in a birthday or anniversary gift box, and make excellent holiday stocking stuffers! Woodside Farm Creamery tokens spend the same as cash and are accepted at our ice cream stand or at any special event where you see the Woodside Farm Creamery trailer serving ice cream. Tokens may be redeemed against the total purchase of ice cream products offered by Woodside Farm Creamery. Token(s) shall be surrendered at the time of ice cream purchase. Token(s) have no cash value. The customer is required to make up any difference between the total cash value of the token(s) surrendered and the price of the ice cream products purchased. Token(s) may not be exchanged for cash ~ only ice cream products. If the value of ice cream products purchased is less than the total cash value of the token(s) surrendered, change will not be tendered. Woodside Farm Creamery is located at the intersection of Little Baltimore Road and North Star Road. The entrance to the ice cream stand is from North Star Road. The Creamery is OPEN EVERY DAY, including the summer holidays, from EARLY APRIL THROUGH LATE OCTOBER. We serve ice cream from NOON UNTIL DUSK. We are closed for the winter months except for holiday pie pick-ups.